Balls Race mobile is a Racing Arcade game for iOS and Android mobile platforms. The game was developed by Ketchap and released for the first time on January 3rd, 2018. It’s a simple game where the player controls a white ball along a strip of track that’ congested with obstacles in many different forms. The obstacles include ramps, moving blocks, and walls which have the capacity to break your ball by smashing your white ball into pieces if it gets to them. To claim victory, you must first reach the finish line by passing about 20-60 other racers along the way. If you manage to get to the finish line and claim victory, you’ll be able to progress to the next track. 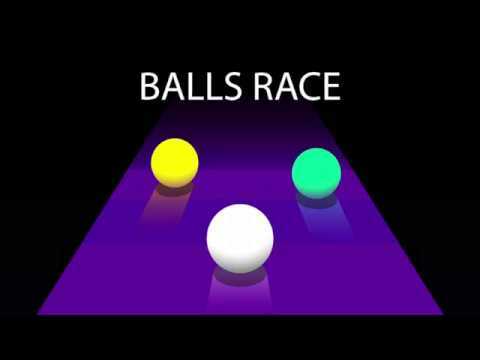 The gameplay of Balls Race is quite straightforward. All you need to do is to race with your white ball past all the obstacles on your way. You must also ensure that you don’t get smashed by the obstacles. The best thing to do is to ensure that you do not care what the other obstacles on your way are doing. Otherwise, you’ll be destructed and the next thing you know is that your ball has been smashed. To help boost the speed of your motion, make use of the yellow speed boosts that are lying around you. They help in keeping the speed of your ball at the top throughout your race. Along the way as you race, you’ll need to avoid smashing into the boxes and that’s why it’s important to not collect too much speed boosts. If you overdo it, the ball will be moving at a top speed and you’ll find manoeuvring your way becomes difficult. This will result in your ball smashing into the boxes and you’ll subsequently fail the race. There are ads in Balls Race whenever you want to skip tracks or if you want to continue from a given spot in your current race. However, since the ads take around 30 seconds, you may as well decide to start from the beginning and get back to where you were within the 30 seconds or less. The choice is yours. There’s also the option of Skip Race. It’s useful if you want to skip an entire race. To do this, you have to watch an ad. The bad news is that most of the time, watching the ad to skip the race is not worth it. This is because, as you progress in the game, you encounter races that become harder and harder. The player plays with a white ball while the other competitor race with the other balls. These balls are to be controlled in order to avoid smashing into the opponents’ balls or the boxes. There are obstacles that exist along the track through which you have to race with your ball. They include walls, ramps, and moving blocks. Speed boosts are laying close to the race tracks and you can use them to boost the speed of your ball. It’s, however, important not to collect too many as the speed of the ball may become too that you won’t be able to control it properly. Balls Race mobile is an addictive game that possesses simple audio-graphics and is easy to play. It would be great for an arcade game lover to experience.